London's water supply is drying up and demand will outstrip supply within a decade, a report has warned. The London Assembly's Environment Committee said two hot summers and a dry winter could also reduce the city's water supplies to "critical" levels. 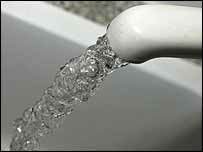 The Green's Darren Johnson who chairs the committee said water companies should do more to cut consumption. Thames Water, London's biggest supplier, said it has a campaign to get customers to be more efficient. In the report, the committee says: "Demand is expected to outstrip supply within the next decade. "Water supply in London is finely balanced and a scenario of two hot dry summers with a relatively dry winter in between would bring the issue to a critical level. "Both demand and supply are expected to be affected by climate change, with warmer weather causing higher water use and increased variability in rainfall causing problems in predictable water availability." Possible solutions at include reducing water pressure. But Mr Johnson said: "At the moment there is no financial incentive for the water companies to get people to reduce the amount of water they use. "We should be looking at changing the system and that new investment is not just into increasing water supply, but we actually get the water companies to put serious effort into reducing the amount each consumer uses." Thames Water said it was trying to encourage customers to save water. It also has a large repair and replacement programme for mains supply, but it will take a long time to complete as many of the pipes are over 100 years old. A spokeswoman for the company said: "Thames Water is investing in mains replacement in London to upgrade Victorian mains and in the mid-term desalination will be vital for the security of London's water supply, and in the long term there are plans for a new reservoir to ensure supply." About 70% of London's water comes from the River Thames and the River Lea in east London. The rest comes from boreholes. Thames Water hopes, if it gets planning permission, to open a desalination plant in Newham, east London, by the end of 2007. In the long term, it is looking at another storage reservoir to be located in south-west Oxfordshire.